Mac OSX not recognizing your Imacon scanner? Try downgrading the firmware to V1.23 with the FR1Uty software. The FR1SX is not recognized? Please check to see if the green LED is ON, if not, you will need the external power adapter. Can't run configuration utility on Windows7? Q Does an optional AC adapter come with the FR1SX? The FR1SX works with the term power from the SCSI device. If the SCSI device does not support term power output to SCSI -bus or the power is not enough, the FR1SX needs its optional AC adapter. AC adapter for the FR1SX does not included in the package. Please ask the manufacturer, if the SCSI device supports term power output or not. You can get the optional AC adapter from online shop. Q What version of Mac OS X is required for scanner device? Q What revision of each Mac OS X is needed for scanner device? On Mac OS X, we tested with Hamrick VueScan. Download a free sample from their web site. please try the VueScan and see if it can recognize the scanner or not. Q Is there a recommended backup software for Mac OS X? Q What is backup software tested with Mac OS X? On Mac OS X, we have tested with RetroSpect version 5.0 or later. Backup software needs to support firewire interface and Mac OS X.
Q What is the FR1 Utility? Q Does the FR1SX need the FR1 Utility to work? Q How to change the settings through the FR1 Utility? The FR1 Utility is a software to change the configuration settings on the FR1SX. If the FR1SX is working well with SCSI device, you don't need to install and use this Utility. Before using the FR1 Utility, please download the latest version from following link. Here is the configuration setting that we usually recommend for scanner devices. For HP ScanJet4C, following settings is needed. 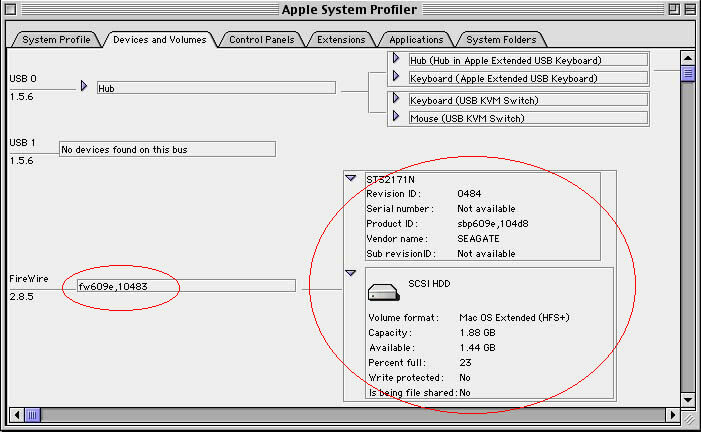 Refer to "Is there a special setting for my SCSI device? ", too. *Don't forget to disable the FR1 Utility after changing the configuration setting. How to install the FR1 Utility on Mac OS 9. Please install the FR1 Utility from Installer and modify the Extensions setting as follows. On the Extensions Manager, select "Mac OS 9.x.x Base" from the pull down menu at the righter side of "Selected Set:". Click "Duplicate Set..." button and name it whatever you like. And then, click "Restart" button. After restarting the system, launch the FR1 Utility, which is in the"FRUTY" folder. *Don't forget to disable following two drivers after changing the configuration setting. No. Please use the application software which compatible with Mac OS X.
Q How many SCSI devices can be attached to the FR1SX? The FR1SX can handle only one SCSI device at the same time. If you connect some SCSI devices, FR1SX will recognize the SCSI device which has the smallest SCSI ID. Q Does the FR1SX support FireWire daisy chain? Yes. The FR1SX supports FireWire daisy chain. And does not support SCSI daisy chain. Q Retrospect backup software returns error on restoring phase on Mac OS X. As of January/2007, we have received some customer reports that Retrospect on MacOS X returns error with some tape drives through the FR1SX. We tested the SONY SDT-9000, which worked fine before, and confirmed the same problem occurs. This problem doesn't occur with the VXA-1. At this point, we don't have a list of tape drives that has a problem with Retrospect. Unfotunately, we don't have a fix/workaround for Retrospect, either. We have been looking for other backup software for MacOS X and we have tried BRU for Mac OS X. There is no problem with the BRU. So far, we recommend the BRU backup software in this case. Q Is there a special setting for my SCSI device? Set 2 at Delay time between power on and SCSI bus reset. Set 12 at Delay time between power on and SCSI bus reset. Set 15 at Delay time between power on and SCSI bus reset. Set 40 at Delay time between power on and SCSI bus reset. According to our record, it works with FlexColor 4.0.x on MacOS X. But the firmware of FR1SX needs to be changed to version 1.23 for the FlexColor software. The firmware and the utility will come with the FR1SX CD-ROM. 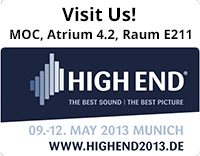 You can download it from our web site, too. 1. Double click "FR1 Utility" icon to launch the FR1 Utility. 2. Click "Enable FR1 Utility" button. The system will be restarted by the utility automatically. 3. Double click "FR1 Utility" icon again to launch the FR1 Utility. 4. Click "select firmware data" button to browse firmware data. 5. The firmware data named FR0123.BIN is located at "old firm" folder. 6. Click "Start firmware update" button. Confirm "Firmware Rev" number is changed to 1.23. 7. Click "Disable FR1 Utility" button. The system will be restarted by the utility automatically. Please don't forget to disable the FR1 Utility after changing the settings. If the utility is enabled, all firewire devices are not recognized by the systems temporarily. According to Imacon tech support, the new FlexColor software versions (starting from 4.5) does not support older SCSI models, such as the FlexFrame camera backs or Flextight Precision scanners. For the FlexFrame and the Flextight, please use FlexColor 4.0.x. Also, an optional AC adapter is needed. Works with the plug-in driver for Photoshop. Regarding the plug-in driver, ask the supplier of the printer. According to the test result, the firmware of the FR1SX needs to be changed to version 1.23. If the device driver of the SCSI device(ie. scanner, tape drive etc.) is not included in Windows or sometimes even if the driver is included, the New Hardware Wizard requires the device driver for “RATOC System_Inc. IEEE1394-SCSI-3 IEEE1394 SBP2 Device”. If the New Hardware Wizard doesn’t appear, but there is a yellow ‘!’ point on “RATOC System_Inc. IEEE1394-SCSI-3 IEEE1394 SBP2 Device” on the Device Manager, the driver of the SCSI device needs to be installed. Double click on "RATOC System_Inc. IEEE1394-SCSI-3 IEEE1394 SBP2 Device" to open "Properties". Click on "Update Driver..." button on the Driver tab. New Hardware Wizard will appear. Select "Install from a list or specific location" and click Next button. Select "Don't search I will choose the driver to install" and click Next. If the device is a scanner device, select "imaging device" and click Next. If thedevice is a tape drive, select "Tape drives" and click Next. If the driver is included, the manufacturer and the model number of the SCSIdevice should be listed. Select proper device and click Next. If there is no driver on the list, specify the location of the driver with using Have disk button. Q How is the SCSI device indicated on System Profiler? The FR1SX is recognized as a FireWire device named "IEEE 1394-SCSI-3", and sometimes the SCSI device will not be appeared on the System Profiler. Particularly Scanners are likely not. Try the scanner software to check if the device is able to work or not. The FR1SX is recognized as "sbp609e, 10483". 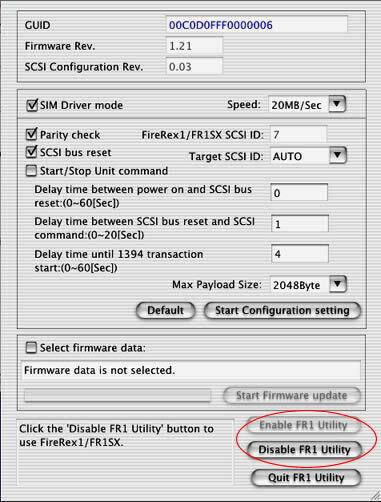 If the B's SIM FireREX1 is not installed in Extensions folder, the SCSI device will be shown as a FireWire device. The inquiry data of the SCSI device will be indicated in the right box. If the B's SIM FireREX1 is installed, instead of the inquiry data, "sbp609e,104b8" will be indicated on the right box. Check the green LED on the FR1SX lights on or not. If the light does not goes on, try to use the AC adapter for the FR1SX. Check the HDD's SCSI ID. Is it set the correct value? Read "Is the SCSI ID of the HDD correct?". Launch the FR1 Utility again, and disable the Utility. Click "Disable the Utility" in the red mark of capture image. (Refer to the capture image.) And then, restart the System. Check if these following drivers are disabled or not. Either or both of them are enabled, disable them and restart the OS. Check the media inserted in the device or not. *Mac OS does not recognize a storage case without any media. And, the media must be Mac formatted. *the FR1SX works with the power from the SCSI device. If the SCSI device does not support term power output, or the power is not enough, you need an optional AC Adapter. Refer to "Is the SCSI ID correct?". These devices are not mounted on the OS. They need to be recognized through an application software. Install the drivers or applications suit for them. Q When I launch the application software for SCSI Scanners, Tape streamers, or Audio Sampler, the error message "No device" is appears. Read "Is the SCSI ID of the HDD correct?" written below. If you installed the FR1 Utility. Q What is the correct value of SCSI ID for the FR1SX? SCSI ID of the FR1SX is "7" at the default settings and it should be always '7'. 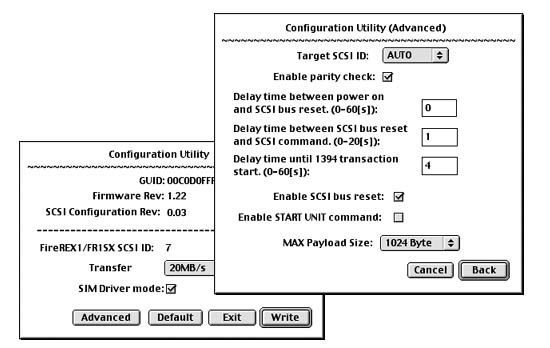 When the target SCSI ID is set as "AUTO", the unit will search devices form SCSI ID 0 to 6. Whatever the SCSI ID is set on the SCSI device (0 to 6, except 7), it should be recognized by the FR1SX.